About a decade ago, Michael Govan, the director of the Los Angeles County Museum of Art (Lacma), worked hard to get Jeff Koon’s Train sculpture installed on the side of the Ahmanson Gallery, where the heavy, full-size wreck of an authentic old-fashioned steam engine would dangle in mid-air off the façade. Reality, however, interfered with this amusing fantasy: it was too difficult and expensive to install and engineer, and Govan could not swing it. But by some stroke of cosmic irony, Govan has aggressively pursued an ill-advised museum rebuild that is driving the institution over a cliff into an equivalent mid-air wreck of its own. 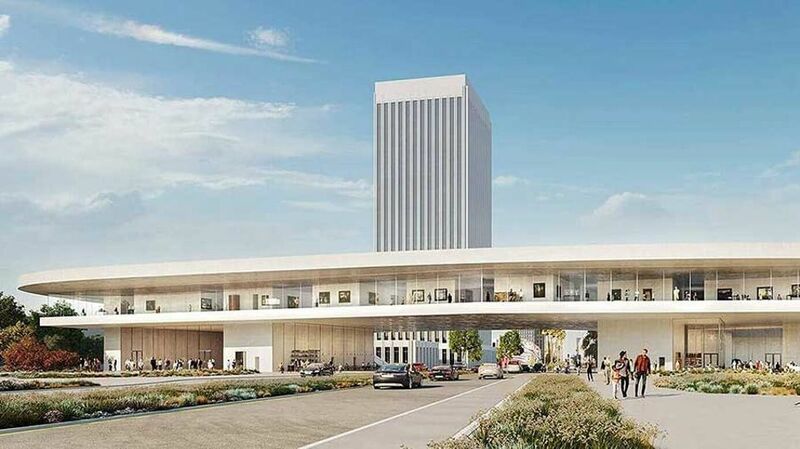 With the Swiss architect Peter Zumthor, Govan is proposing to replace four existing gallery buildings on the East Campus, three from the 1960s and one from 1986, with an elevated, amoeba-shaped, glass-enclosed building that takes a running jump from the East Campus across Wilshire Boulevard to land, derring-do, on the corner lot opposite. Neighbours are incensed at the arrogance of this art-über-alles gesture that plants a freeway overpass in their midst, compromising venerable Wilshire Boulevard with a permanent installation no one asked for. In politics, you follow the money, but in architecture, you count the square footage, and I hired an architect to do a spatial audit of the plans, which revealed that the Zumthor building reduces the overall size of the four buildings it replaces by 143,500sq. ft (or 37% less) and that it will be short on galleries by 53,000sq. ft (33% less). The linear footage of wall space will decrease by about 7,500ft, or 1.5 miles, consigning some 1,500 works to storage. A full 65,000sq. ft of existing offices are also gone, and the offices will have to be rented off campus (at an expense of $3.6m per year), separating the curators and directors from their collections. It is perhaps the only major museum rebuild ever in America to propose a reduction rather than expansion, an especially counterproductive move given that Lacma’s curators, and even Govan himself, have collected tens of thousands of works since the museum erected the Art of the Americas Building in 1986. The museum desperately needs more room, not less. There is another sly aspect to the design that Govan, without much fanfare, has slipped into the new architectural equation on the East Campus. After ten years of work, the museum has still not published even a rudimentary floor plan of the one-storey, 3.3-acre gallery floor that is elevated over the campus and Wilshire. But the dreamy soft-focus renderings of the interiors reveal a design that is uniform throughout, with naturally lit spaces bounded by textured concrete walls. Not only is there a drastic reduction in the number of galleries, but no concessions have been made to departmental collections—Chinese, South and Southeast Asian, Islamic, contemporary, European, pre-Columbian, Latin—that require environments adapted to the objects. It is a one-note design. The homogeneity is intentional, in fact, because the design purposely eliminates departmental collections. Administratively, Govan wants to dissolve the curatorial departments per the recent museum fashion of breaking down walls between disciplines, historical periods and geographical roots. The many separate Lacma collections are now slated to enter a giant raffle bowl of some 130,000 objects, from which curators can pluck objects as they wish to create interdisciplinary, cross-cultural thematic shows that escape the so-called silos that isolate art into false, restrictive categories built up by old white guys over the centuries. When Govan came on board in 2006 with architectural ambitions imported from his alma maters—the Guggenheims in New York and Bilbao, and the Dia Art Foundation in Beacon, in the Hudson Valley of New York—Angelenos understood he would refresh the campus with interesting architecture. But no one anticipated that he would sponsor a design that dismembered the museum as it had been structured, painting by painting, for over a century. If not perfect, departments were a nexus of informed collecting, and in themselves a living construction as worthy of preservation and perpetuation as any historic building. The great universal collections like the British Museum built knowledge by amassing specimens around categories, to understand how they related to other specimens and to those in other categories. It is what Darwin did, and Darwin got pretty far. The museum was not broken; it did not need a new paradigm. It just needed a lot of new space that supported the collections rather than worked against them. Govan’s thinking was perfectly suited to Dia: Beacon, where all the Minimalist art could bask in the environmental softness of natural light cultivated by the Light and Space artist Robert Irwin in the adaptive re-use of an old factory. But Lacma, like the Metropolitan Museum in New York and the Art Institute of Chicago, already has an intact and viable organisational structure that does not need to be deconstructed through design that acknowledges no difference in its objects. Architecture has often been used to define and build an institution. In this case, design was enlisted to dismantle a department-based museum in favour of an alien paradigm. The current To Rome and Back show, which Govan touts as an example of the new thematic exhibition going forward, is a conspicuous failure, and becomes instead an example of why dissolving departments might not be such a great idea: The relationships established among the rather casually chosen pieces seem as arbitrary as the action in a pinball machine. The Los Angeles County Board of Supervisors votes tomorrow on approving the project, and with it, partial funding of $125m and an associated $300m bond. Govan has the support of his board and politicians—more through his personal charisma than through the power of his arguments. It remains to be seen whether reality, however, will interfere with his plans. Storm clouds are massing. There will be battles. It was too difficult and expensive to install Jeff Koons’s train wreck at Lacma, and the project quietly died. The cultural expense, not to mention the cost itself, of going forward with Govan’s impending wreck may be too high a price to pay.